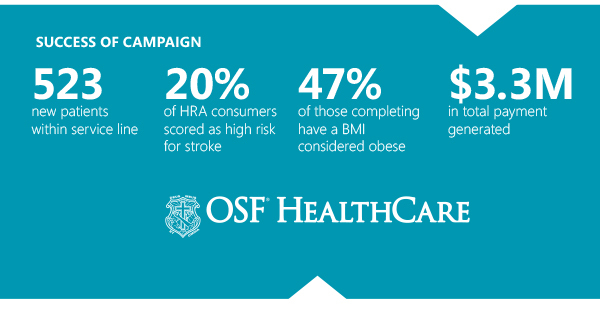 OSF HealthCare, in west central Illinois, had made the decision to focus hefty strategic efforts on driving traffic to stroke prevention and services. The goal was not to simply pull in existing patients with stroke symptoms or risk factors, but instead help the communities they serve to better understand that stroke risk can be identified early through proper assessment. Further, they worked to educate their audience that the initial steps for the consumer does not necessarily mean making an appointment, as many stroke symptoms can be tracked via proper digital assessment of factors like genetics, lifestyle choices and physical condition. 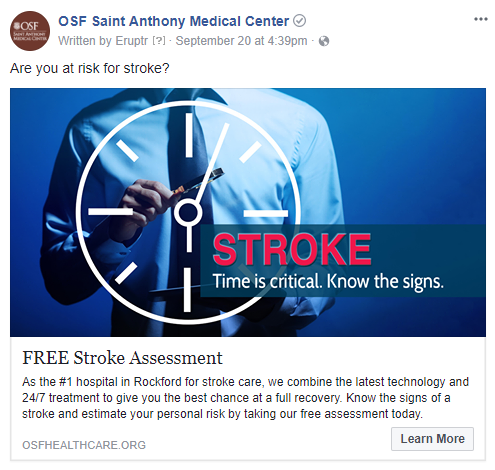 The marketing and digital teams paired up to devise a comprehensive, market-wide initiative that focused on very specific targeting of those in the community who were most at-risk for stroke, who had not previously experienced one, via their CRM. Using a mix of digital, direct mail, outdoor, radio and other mediums, OSF drew the right people at the right time. The next challenge was getting those people to take action. In this case, the most successful call-to-action (CTA) was the online health risk assessment (HRA) which determines individual stroke risk. The Medicom Stroke HRA takes into consideration things like previous health problems, comorbidities and understanding of one’s blood pressure and cholesterol numbers, while providing results ranging from Low to High Risk. 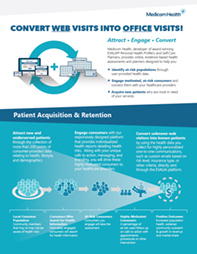 Messaging in follow-up emails and provider outreach was suited to the consumer’s own individual risk level, making for personalized healthcare outreach. Using the HRA as the CTA, the OSF team was able to capture contact info and risk level on 1,480 users in just 8 weeks. These users spent, on average, nearly 5 minutes on the site. Those individuals were then fed into the CRM system, allowing the OSF team to track downstream revenue on these individuals. During that brief time period, just under 10% of those completing HRAs converted to patients. We wanted a strong interactive call to action for our marketing campaigns and the Medicom HRAs have been a great solution to increasing our response rates. The risk assessments provide us a way to capture contact information and determine risk level to follow-up with risk-based emails. By providing more personalized content, we direct people through our marketing funnel and have taken our campaigns and results to the next level. Because of the trackable results, we are using the Medicom HRAs across our 11 OSF HealthCare hospital markets and for numerous disease states.